In 1995 I took a trip to Tucson, Arizona, to attend the 5th Annual Conference on Astronomical Data Analysis Software and Systems (ADASS). After the conference I went to visit the Space Telescope Science Institute in Baltimore, Maryland. I did not keep a daily diary on this trip (or if I did, I've lost it). This account was written in 2019 from memory and piecing together clues from my photos. The ADASS Conference ran from Sunday 22 October to Wednesday 25 October. The reason I was attending this particular conference was because I'd just started a job with the Australia Telescope National Facility, working to develop an online version of the Astronomical Society of Australia's journal: Publications of the Astronomical Society of Australia (PASA). This was the early days of scientific publishing on the web, and institutions were basically just doing this online publication thing themselves. I probably arrived in Tucson on the Saturday just before the conference began. 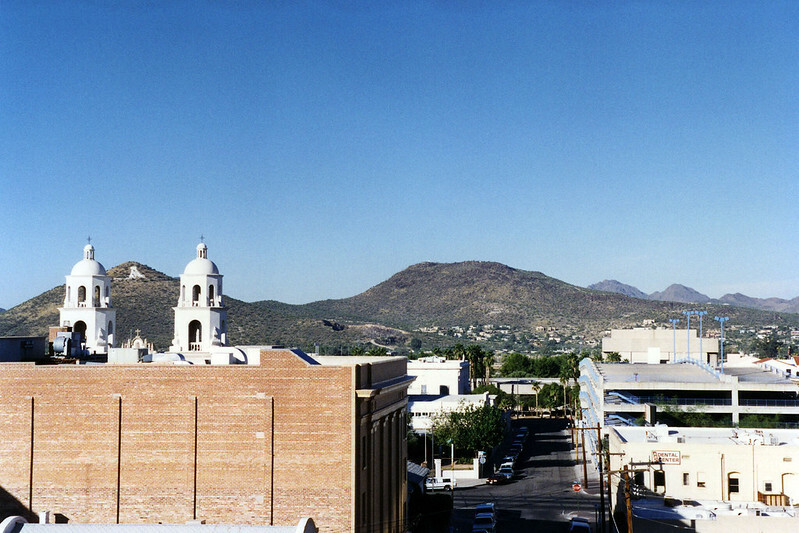 The conference was held at the Tucson Convention Centre. The conference hotel was the nearby Holiday Inn City Centre, which seems to have vanished. From a photo I took from my hotel room window, I can identify that the hotel I stayed in was on the corner of South Scott Avenue and East 12th Street, but now (in 2019) that spot seems to be a car park, so I'm guessing the building has been redeveloped. My hotel room looked west out over a nearby building to the twin Spanish mission design bell towers of Saint Augustine's Catholic Cathedral, and then to a cluster of hills beyond the city. I was impressed by the hot, dry desert climate. 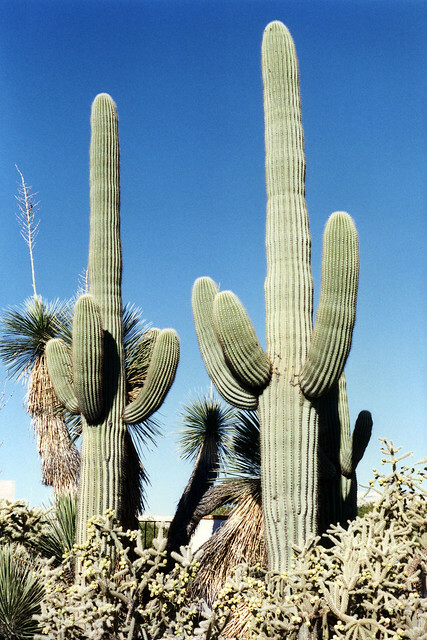 And the giant saguaro cacti all over the place. 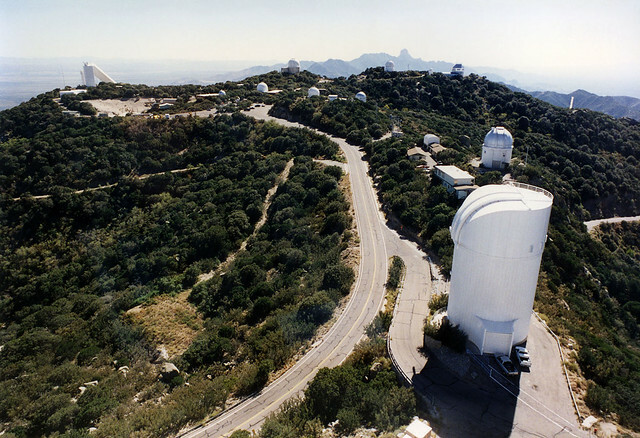 The first day of the conference, the Sunday, there were two options: an object-oriented software workshop, or a tour to Kitt Peak National Observatory. Obviously I chose the observatory tour. A bus left the hotel at 11:30, to return at 17:30, in time for the conference reception, with snacks and drinks, from 19:00 to 21:00 the same evening. 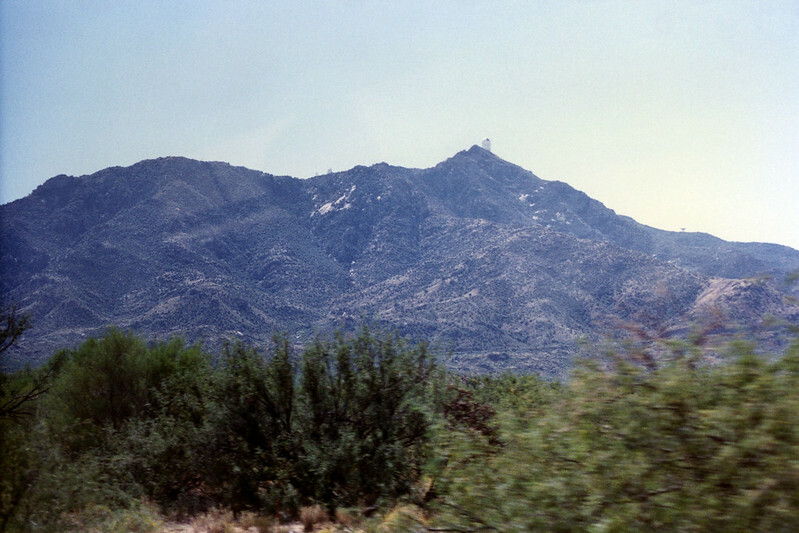 The observatory is on Kitt Peak, about 88 km south-west of Tucson, so it would have taken us a bit over an hour to get there. 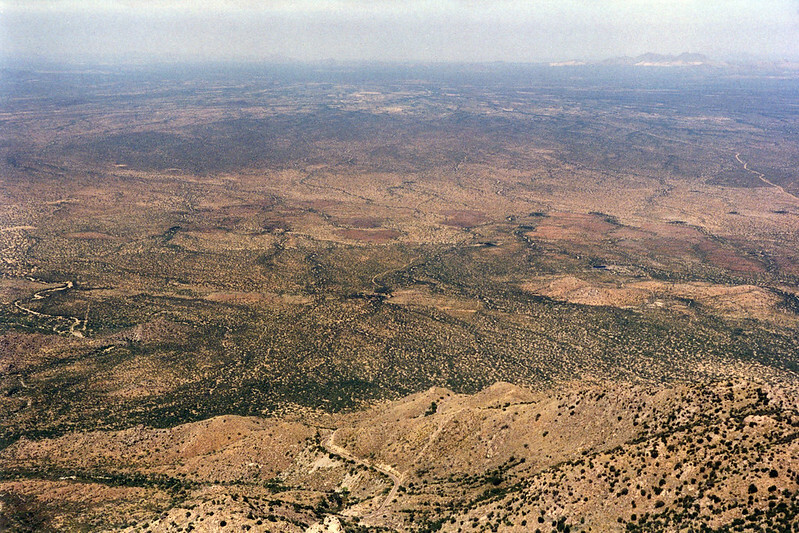 Kitt Peak is the highest point in the Quinlan Mountains, and has an elevation of 2098 metres. 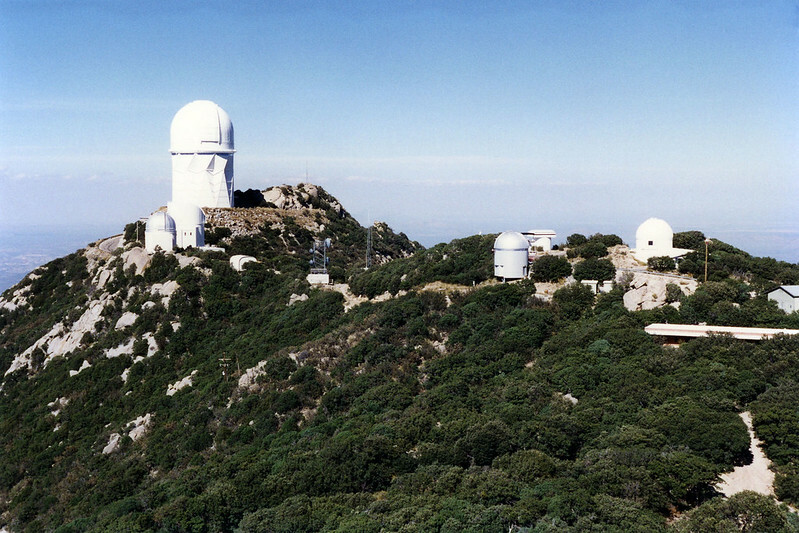 There are several telescopes clustered around the top of Kitt Peak. We visited the WIYN Observatory, the ARO 12-metre Radio Telescope, the VLBA antenna, and the McMath–Pierce solar telescope. This last one was particularly interesting, as it projects a huge disc image of the sun onto the floor, and it's very easy to see surface features such as sunspots. Telescopes on the top of Kit Peak. The largest one at left is the Nicholas U. Mayall Telescope. The final stop of the afternoon was to be the Nicholas U. Mayall Telescope, the largest telescope on Kitt Peak, with a 4-metre primary mirror. If you look at a map of the Kitt Peak site, you can see that the Mayall Telescope is a bit away from the main cluster of telescopes. The bus took us over to the telescope and we got to have a good look around. We went out on to the walkway around the dome, and from up here the view of the surrounding mountains and the Arizona plains below were amazing. View from top of the Nicholas U. Mayall Telescope. With our visit done, we piled back into the bus for the trip back to Tucson. If you look at the map again (and the photo above), you can see that the side road to the Mayall Telescope joins the main access road for the mountain at a very sharp hairpin turn intersection. What you can't see on the map is the steep slope of the roads. The bus attempted to take this hairpin turn left, heading downhill, but ended up grounding the bottom of the chassis on the road, suspending the drive wheels up in the air! After a couple of minutes of helplessly spinning the wheels, the bus driver ordered us out of the bus. By now it was late afternoon, and the desert air at this altitude was starting to get cold. We walked back to the observers' recreation building, which had lounge and kitchen areas, and took shelter there as the bus driver phoned back to Tucson for assistance. He told us that they were sending a crane to come and lift the bus back to a position where it could move. This would take a few hours! So we were stuck up the mountain as it started getting dark, and very cold. Fortunately we could sit indoors, but there wasn't much to do except talk to the other people in the same situation. I got into a conversation with some of the other astronomers, who were interested in asking me about Australia. We got to talking about sports, and I ended up explaining cricket in some detail to them. Eventually the crane arrived and attempted to free the stranded bus. I don't recall how long this operation took or if they also sent another bus to pick us up. But it was pretty late by the time we got back to Tucson, and we'd missed the conference reception. I don't remember much about the conference itself. I remember walking to the convention centre from the hotel, and the streets being fairly empty of traffic. I recall walking to a nearby sandwich shop for lunches. And that's about it. After the conference was over, I travelled to Baltimore, where I'd been in 1991 to visit the Space Telescope Science Institute (STScI), on the grounds of Johns Hopkins University. I don't remember if I stayed in the same block of apartments or a nearby hotel, but it was again just a short walk to the STScI. Again, rather than visiting here for scientific research, I was visiting to collaborate with a person there who was doing work on electronic publishing of research. I don't really remember much of what I did there, or even how long I stayed in Baltimore on this trip. It must have been at least two weeks, because I do remember a few of things that happened during my time here. The first was Halloween. 31 October was the Tuesday after the conference. Being a working day, I just showed up at the STScI as usual, and didn't expect anything unusual. I soon discovered that most of the people there took the day as an excuse to dress up in costume. There was also a lunch-time party in the cafeteria, with special food and decorations. At the time I had no idea that American adults participated in Halloween like this - I'd assumed it was just a thing that children did. 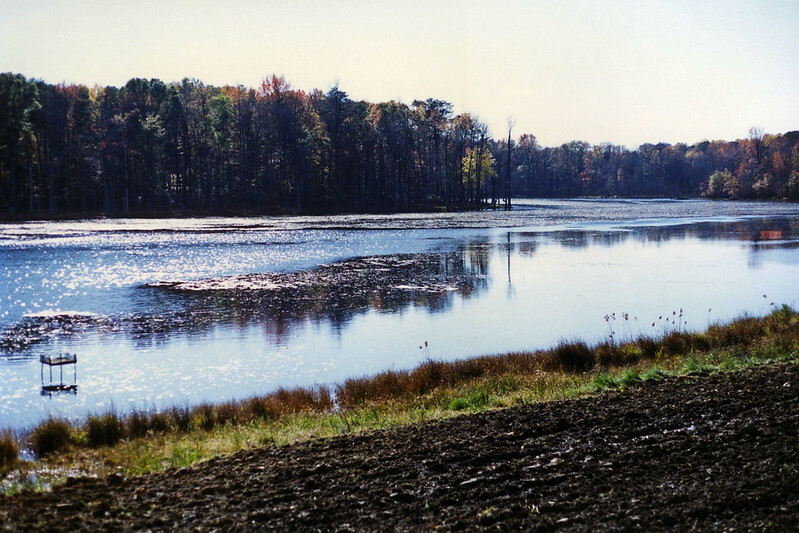 He also took me to a forest and lake/river area, which I'm guessing from a map of the area might have bene the Patuxent Wildlife Research Centre, or some of the forested area nearby. I also mentioned to Bill that I would like to get a trenchcoat, and he said he knew a place to get them at good prices, so he took me there. It was a sort of clothing warehouse place, and I indeed bought myself a trenchcoat, which I still have and use to this day. During my stay in Baltimore, a couple of other online friends from the alt.callahans newsgroup were getting married, and they had invited me to the wedding. I've lost contact with them, but think their names were John and Mary. The wedding was in Pittsburgh, Pennsylvania, and I figured that the trip from Baltimore wasn't too far so I decided to go. 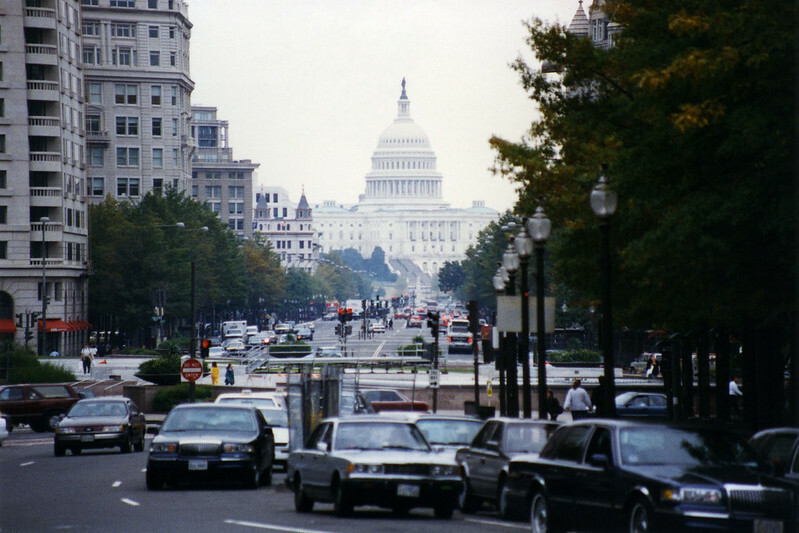 They had a friend living in Washington D.C., who was planning to drive to Pittsburgh, so all I had to do was make my own way from Baltimore to Washington, which I did by catching a train. I arrived in Washington with some time to spare before our departure for Pittsburgh, so I met this woman (I forget her name) and we spent a couple of hours seeing some of the sights of Washington. 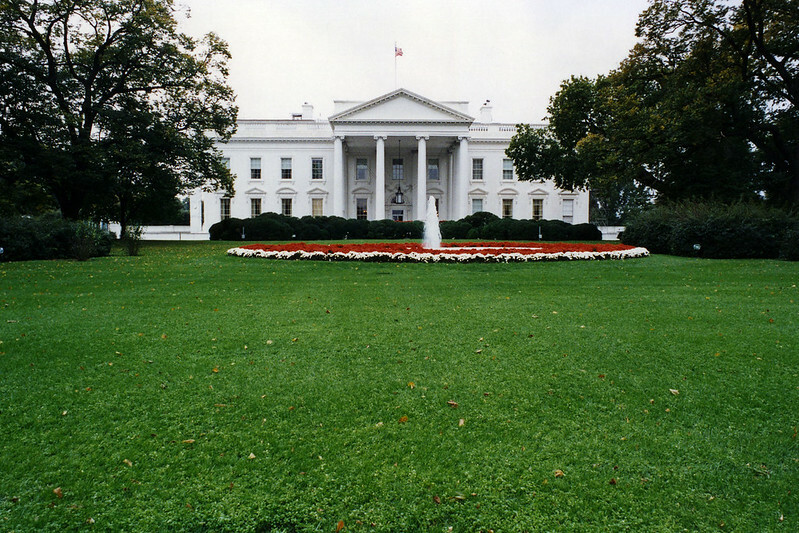 We went to the front of the White House, and then around the back, where we could see the Washington Monument and the road leading towards the Capitol Building. This was about all we had time for, so I didn't see much else of the city. We left for Pittsburgh, driving in her Saab. At some point we picked up two other passengers (males), making four of us in the car. The main thing I remember about the trip was driving across the countryside and being astonished by how many dead trees there were all over the place. I asked if there'd been some sort of fire or other disaster, but it turned out that the trees had merely lost their leaves for the coming winter! 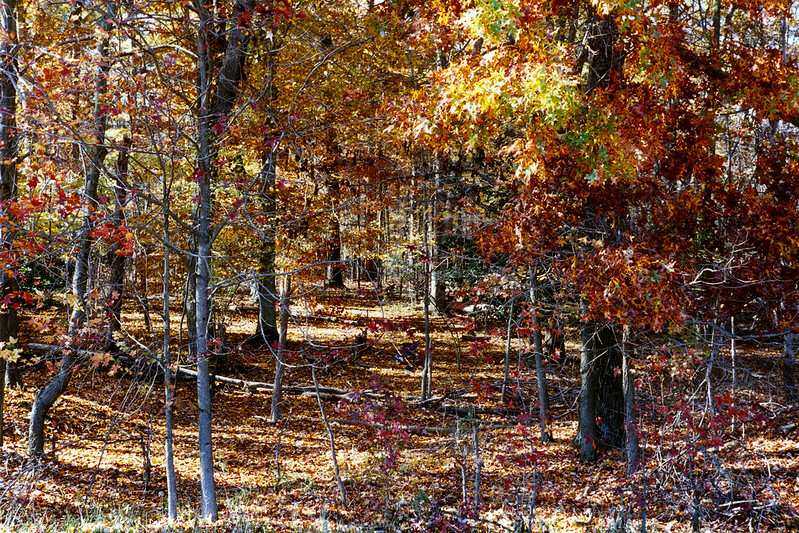 I was genuinely surprised, as the thought of trees losing their leaves for winter hadn't occurred to me, since the forests in Australia don't do that. When we got to Pittsburgh, we had to navigate to the hotel where the out-of-town wedding guests were staying. I was given the large paper map, and tried my best, but Pittsburgh is built on very hilly terrain and often streets that looked like they intersected on the map actually passed above and below one another, with no way to turn from one on to the other. A few times I instructed the driver to turn at the next intersection, only to find the cross street actually passed under us or over us. At one point we stopped to get our bearings. I had one of the others take a photo of me apparently seeking a way onward, peering out at the urban landscape. 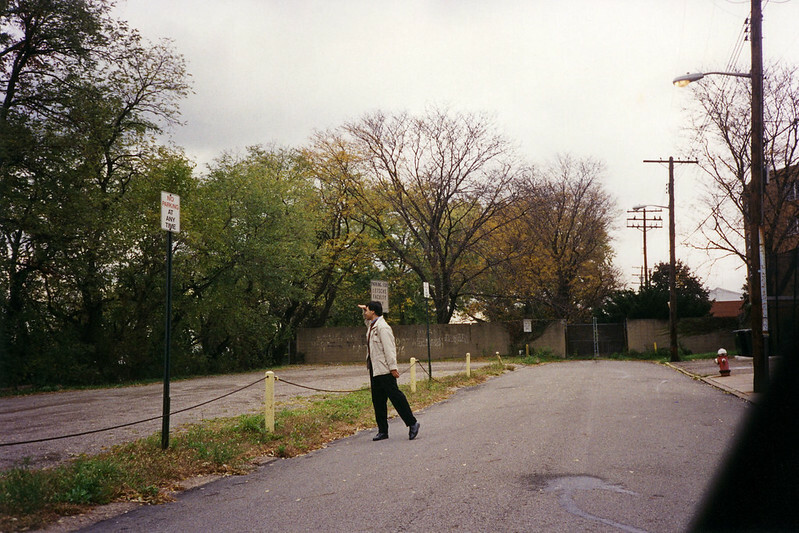 I had no idea where we were at the time, but many years later I tracked the spot down with a clue from a sign in the photo ("Letsche faculty only"), Google Search (finding Letsche Elementary School), and Google Streetview, finding the location on Cliff Street, behind the school which was on Bedford Avenue. We stopped at another place to get petrol. 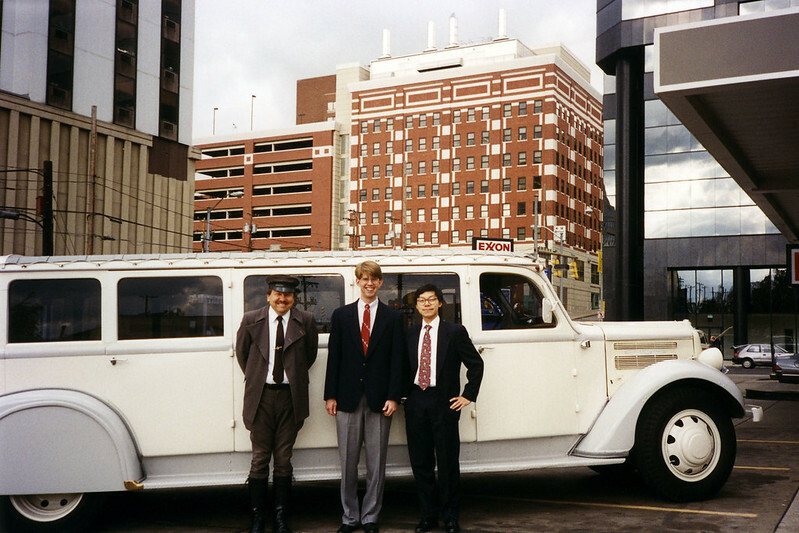 While we were there, we saw an amazing old style limousine and its uniformed driver. The two guys in our group were fascinated by the old car, and wanted a photo of them with it and the driver, who happily obliged. I wasn't been able to identify exactly where this was from the photo I have, but a helpful commenter on Flickr managed to find it, at the corner of McKee Place and Forbes Avenue (Google Streetview). Eventually we found the hotel. There were several other wedding guests from out of town staying there too, and we all met up and organised dinners and things together. One thing that I was excited about being in the US at this time was that the latest expansion set for the game Magic: the Gathering had just been released, and prices were much cheaper in the US than back home in Australia. So I asked one of the people there to take me to a game store, where I bought two sealed boxes of the expansion set: Homelands! Little did I know that this would soon become known as one of the worst sets of all time. The wedding was fun. After cutting the cake, John and Mary stuffed each other's mouths with pieces of cake, getting it all over the faces in the process. I was surprised to see this again, after Allison and Terry did it at their wedding that I attended in California in 1993. I didn't realise that this is a tradition at American weddings, because we don't do the same tradition in Australia and I'd never seen it before. After the ceremony, I joined in dancing with some other guests. I'd been taking partner dancing lessons back in Sydney (modern jive), and this was a good opportunity to try out some of the dance moves with partners who weren't all that familiar with them. I found one woman who was good at picking up the cues and doing complementary steps, so that was a lot of fun. After the wedding we drove back to Washington the next day, Sunday. Unfortunately we got back to Washington just after the last train to Baltimore had left. So the woman who drove us to Pittsburgh kindly offered to let me sleep on the sofa at her place. It turned out she had a whole collection of Footrot Flats books, which surprised me because I didn't think anyone in the US would have heard of this comic strip. On Monday morning I caught the train back to Baltimore to continue my work at the Space Telescope Science Institute. 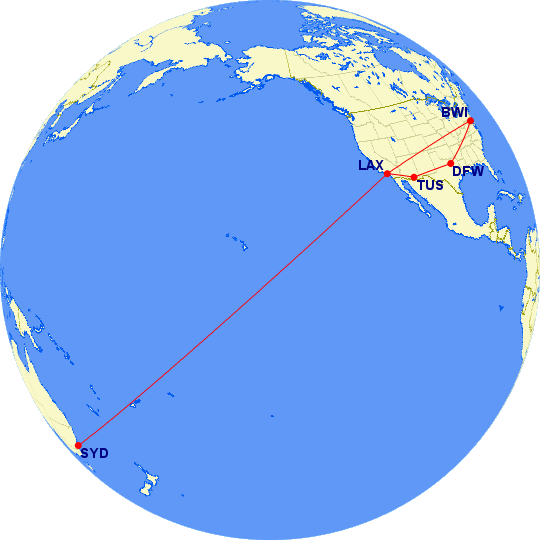 These are the most direct flights I could have taken - I don't remember exactly what flights I took. I'm pretty sure I stopped at Dallas on the way from Tucson to Baltimore. It's possible I may also have had to transfer at Phoenix on the way from Los Angeles to Tucson, or Denver on the way from Baltimore to Los Angeles. Last updated: Wednesday, 20 March, 2019; 16:47:47 PDT.